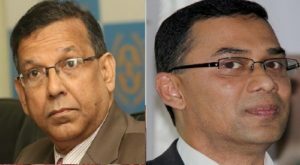 Probashbangla24 online Desk : Expressing satisfaction over the verdict in the cases regarding August 21, 2004 grenade attack, Law Minister Anisul Huq said Tarique Rahman was the main hero (mastermind) behind the attack and he deserves death penalty. “But, he (Tarique) was given life imprisonment. After through scrutiny of the verdict, we will file appeal with the higher court for enhancement of his punishment,” he continued. “It was quite satisfactory as all of the accused of the cases had been sentenced in the verdict,” he added.